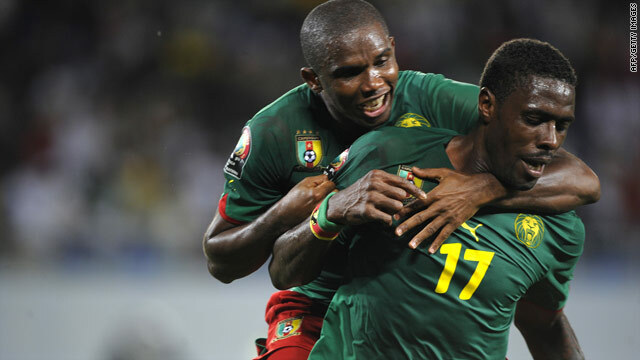 Mohammad Idrissou celebrates Cameroon's winning goal with captain Samuel Eto'o in their 3-2 victory over Zambia. (CNN) -- Mohammad Idrissou put Cameroon on course for a spot in the African Nations Cup quarterfinals with a late winner in a topsy-turvy 3-2 Group D victory over Zambia. Zambia bossed the first half and went ahead inside 10 minutes through Jacob Mulenga. A terrible mistake from Zambia keeper Kennedy Mweene allowed Geremi to equalise and Samuel Eto'o gave Cameroon the lead in the 72nd minute. Christopher Katongo thought he had earned a point with an 82nd-minute penalty but Idrissou had the last word for Cameroon just four minutes later. The Indomitable Lions were looking to ignite their campaign after a shock 1-0 defeat by Gabon in their opening match, which was also a first loss for manager Paul Le Guen. But it got worse for the four-time champions in only the eighth minute, and it was experienced center-back Rigobert Song who was the architect of his own side's downfall. Felix Katongo swung in a great cross from the left and, in attempting to head behind, Song instead drew a point-blank save from his keeper. Carlos Kameni, though, could only push the ball out to Mulenga, who was left with a simple tap-in. Zambia should have doubled their lead before half-time. Rainford Kalaba's fierce free-kick was pushed back into the danger area by Kameni but Christopher Katongo could not direct his shot away from the keeper. And that was made to look very costly in the 68th minute when a calamitous mistake from Mweene saw Cameroon draw level. Geremi sent in a hopeful cross from the right wing that the Zambia keeper inexplicably helped into his own net. And the turnaround was complete four minutes later thanks to Eto'o. With Zambia appealing for handball, the striker collected Somen Tchoyi's cross and fired into the far corner. But Kameni handed Zambia a way back into the match with his own rash bit of goalkeeping, scything down Mulenga on the left edge of his penalty area to concede an 82nd-minute spot-kick, which was coolly dispatched by Christopher Katongo. There was another twist to come, though. Four minutes later, Geremi swung in a free-kick from near the halfway line and Idrissou rose above the defence to power his header into the bottom corner. Meanwhile, Gabon added a 0-0 draw with Tunisia to their opening win against Cameroon as they put themselves within touching distance of the last eight. There was little between the two sides at the Nossa Senhora do Monte and a draw was a fair result.